I'm a little late on the Christmas recap, but I wanted to document Charlie Beth's first Christmas season before we venture too far into the new year. Christmas is always special in our home, but having our sweet baby girl here to celebrate with us this year made it even better. At seven weeks old, the only thing Charlie Beth was interested in this Christmas was staring at the lights on the Christmas tree, but mommy and daddy made lots of memories with our girl for her first Christmas. I was so excited to introduce Charlie Beth to Santa Claus. So excited, in fact, that she actually met him twice! She met him the first time with her YaYa and Grandpa (Steven's parents), Aunt Morgan, and Steven and myself, and she slept right through the entire thing! Charlie Beth was a party girl this holiday season attending not one, but three Christmas parties! She attended my office Christmas party where she was the star of the night! For those that don't know, I work (or at least I did before baby came along) for my dad, so he was very excited to show his granddaughter off at his party! Charlie Beth also tagged along with mommy and Nana to an ornament swap party with the ladies of our church. She fit right in with all the girls! 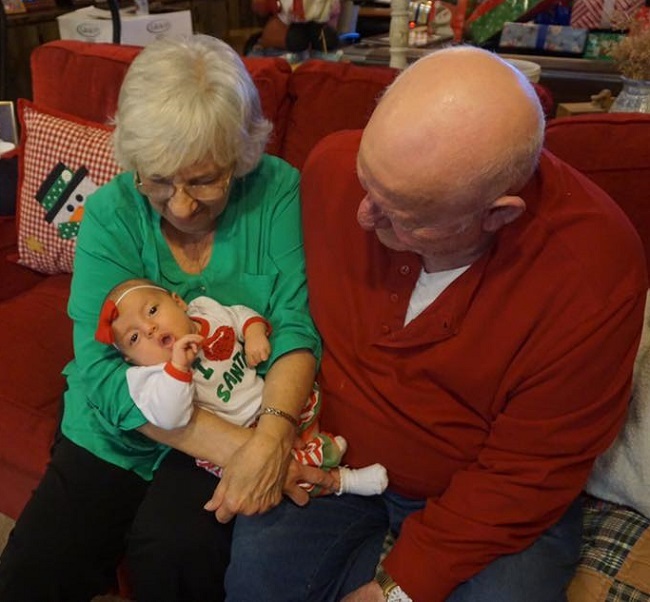 For her last party of the season, Charlie Beth attended a small Christmas get together where she met several of Nana and Papa's friends. She was a very busy girl this Christmas! The weekend before Christmas we took Charlie Beth on her first road trip to Arkansas for a Christmas celebration with Steven's extended family. His family had not yet met Charlie Beth, so we were excited to introduce our girl to everyone. We drove over to Arkansas on Friday and spent the weekend celebrating with family. Charlie Beth did amazing on the car ride there as well as the ride home! She had so much fun meeting her great grandparents, aunts, uncles, and cousins! Our shopping trip was done a day early this year because for the first time my family decided that we would celebrate Christmas at my parent's lake house. My mom and dad purchased a new lake house over the summer, and with more room for everyone in this house we decided we would have more room to spread out there. We drove down to the lake house on Christmas Eve and spent the evening soaking in lots of family time with my parents, brother, grandmother, and my mom's sister. We woke up bright and early Christmas morning and started in on the festivities! We had an unusually warm Christmas this year in Alabama. In fact, on Christmas morning we sat outside on the back patio (in shorts and no shoes!) and drank coffee. 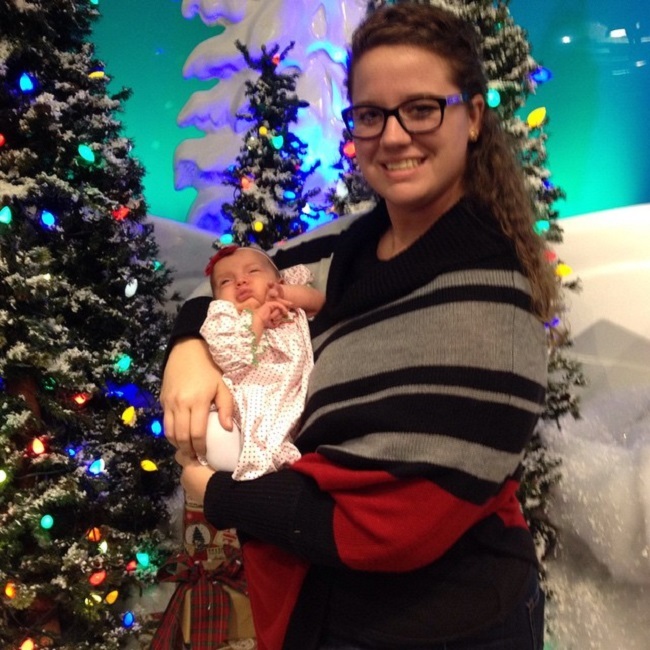 Charlie Beth must have really impressed Santa in her seven weeks of life because he brought her lots of fun surprises! CB enjoyed watching the family open gifts from the comfort of her beloved swing. After presents were opened we enjoyed a delicious brunch complete with mimosas and shrimp and grits. It was the perfect meal to enjoy while overlooking the water! After brunch Charlie Beth, Steven, and I drove back to Birmingham to celebrate Christmas with Steven's parents and sister. We had a wonderful afternoon celebrating and spending time together. A couple of hours later as we were about to sit down and play a board game things began to get interesting! Suddenly the tornado sirens starting blaring outside. Freaking out, I immediately turned on the television to see the meteorologist tracking a tornado in Birmingham. I'm not usually one to freak out over storms, but at that moment all I could think about was protecting my baby. Long story short, the tornado they were tracking was heading straight for our area. We were instructed by the meteorologist to head to our safe space, so I strapped Charlie Beth in her car seat and we hid out in the bathroom praying that the tornado wouldn't touch down. Of course, while the girls were hiding out in the bathroom, Steven and his dad were standing outside on the front porch looking for it. Thankfully the tornado did not touch down by our house, but it did destroy several homes on the other side of Birmingham. With the tornado scare out of the way, we finally sat down for a family game night. It was the perfect ending to a wonderful first Christmas with our sweet baby girl. This Christmas was by far the best one yet, and I know they will only continue to get better from here! haha girl certainly had quite the selection of Christmas outfits!! It was hard to not look at all the adorable little Christmas outfits this year though...figured I should at least wait til this little one is actually born! I love that second visit with Santa photo! So cute!!!! Looks like she was one stylish girl this Christmas! Love all of her cute outfits. The tornado situation on Christmas was so not cool. Not cool at all!!! Glad you guys were out of the path! Looks like y'all had a great first Christmas as parents! 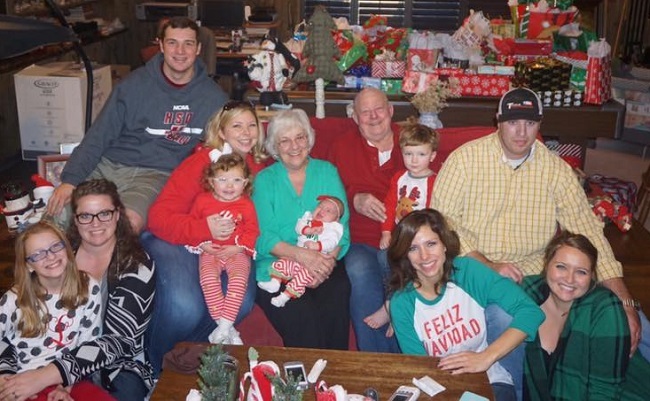 So glad y'all got to see so much family and make lots of memories for Miss Charlie Beth's first Christmas. So sweet! She was definitely a busy bee! haha Sounds like such a fun few weeks of celebrating! Awe precious! Looks like she had a busy first Christmas. Those jammies are adorable on her. Happy New Year! Could she be anymore precious?! LOVE! In that picture where her mouth is open and lookin like she's yawning, she looks EXACTLY like your hubby! I love her sweetness!!!! What JOY to celebrate Christmas with your little girl! Love this. What a wonderful season you had! I love all her Christmas outfits, so dear. I'm glad you were all safe from the storms. xoxo. She's the most festive baby I've ever seen! So much cuteness! She is too cute! I want her wardrobe!